BuzzFeed, the aggregator of viral and trending news and multimedia links, launched a Kindle Fire app this week that boasts features and performance not yet found on the publisher’s iOS and Android apps. BuzzFeed for Kindle Fire leverages a Web accelerator “Silk” platform that Amazon claims improves Internet browsing speed. BuzzFeed says this version of the brand is the fastest iteration yet. BuzzFeed is a social news app that tries to keep its trend-watchers ahead of the viral curve. The Fire app, for instance, includes BuzzFeed’s Hot List, which is not available on other apps. The list employs an algorithm that claims to calculate the top 10 stories on the Web that are about to get rapid viral distribution. 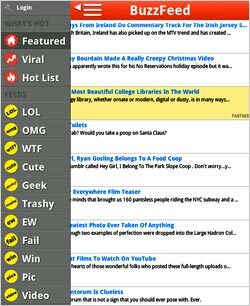 Exclusive to the Fire app for now, the user can access additional stories and categories from a slide in the left nav bar, and a bottom rail facilitates user commentaries and tagging of stories as “LOL,” “Cute,” “Geeky,” etc. “These features aren’t going to stay just on the Kindle Fire,” says Jon Steinberg, president, BuzzFeed. “But when we were looking where to push the new features, it struck us that the Fire is a very consumptive platform. It seemed like a good time to push the next version onto the Kindle and put our resources there." BuzzFeed -- which claims over 30 million monthly users across the Web, apps, and mobile Web -- says it has seen traffic to its content from mobile devices increase more than tenfold in the last year. The brand is available both in dedicated apps as well as the mobile Web. Most of the features native to the Kindle Fire app will migrate to the Android and iOS apps in the first quarter of 2012. Amazon has been characteristically cryptic about the actual number of Fire tablets it is selling. Its recent announcement that more than 1 million Kindles were shipping a week cagily blended e-reader and tablets into a single figure. In its News category of the Android Marketplace, BuzzFeed is ranked the 24th-most-popular app, not far behind Huffington Post (#18), NYTimes (#14) and USA Today (#11) While Amazon’s Kindle Fire uses the Android operating system, compatible apps need approval from the Amazon App Store. Steinberg says the approval process was familiar after working with Apple on the BuzzFeed iPhone app. “It was roughly the same. It took about one to two weeks to get through the approval process and we got through the first time.” Many developers complain that heavily modified and curated Android devices like the Kindle Fire, Nook Color and Nook Tablet fragment the Android platform into multiple approval processes and separate app builds. But Steinberg insists there wasn’t much of a hassle here, with little extra development time required to modify the existing Android app. BuzzFeed monetizes its content with sponsored partner posts in the news feeds. The in-stream units are highlighted in yellow and appear once in a stream. The format remains the same across all BuzzFeed’s platforms, including the New Kindle Fire app. Advertisers have included GE, Experian, Coca-Cola and Samsung. While BuzzFeed may claim a unique take on trending news in a relatively uncluttered new Fire market, the library does not lack news aggregators. In addition to the Huffington Post, Yahoo and AP Mobile, the category already includes lesser-known news-gatherers like News360, Express News, News Republic and countless RSS readers.